Create Tasty Puffle Cakes With This Recipe! Hey everyone! 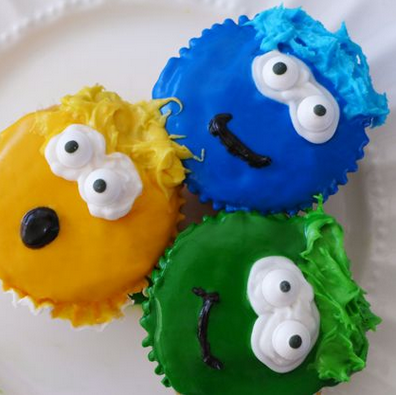 I came across this awesome recipe for creating some puffle cup cakes! Here is everything you need to know if you want to make some of these. 2. In a large mixing bowl, stir together flour, sugar, baking powder and salt; set aside. 3. In a separate large mixing bowl mix butter and sugar until smooth. Add eggs, 1 at a time and stir in vanilla. 4. Add dry ingredients to butter mixture and stir in milk. 5. Scoop batter into baking cups filling about 2/3 full. Bake until a toothpick inserted in the center comes out clean, 17 to 20 minutes. 6. Frost top of cupcakes evenly with cookie frosting. Let set for 1 hour. 7. Mix white frosting with cookie icing and use for decoration for the Puffles' hair. Use a spatula to lift the frosting and give it that "messy hair" look. 8. Adhere candy eyes with white frosting. 9. Using the black candy writer, draw cute expressive mouths on your Puffles. Are you planning on trying this? If you tried this already be sure to let me know by leaving a comment here, tweeting to me on Twitter (@Airhead32) or emailing me at AskAirhead@yahoo.com!